Nails Inc are always coming up with something new and wacky for nails, each time I think- no way, this has to be the one that’s just a bit silly – but somehow they pull it off. With the Grafitti polishes, or denim, or leather, or monogrammed… and now ‘Modern Art’. 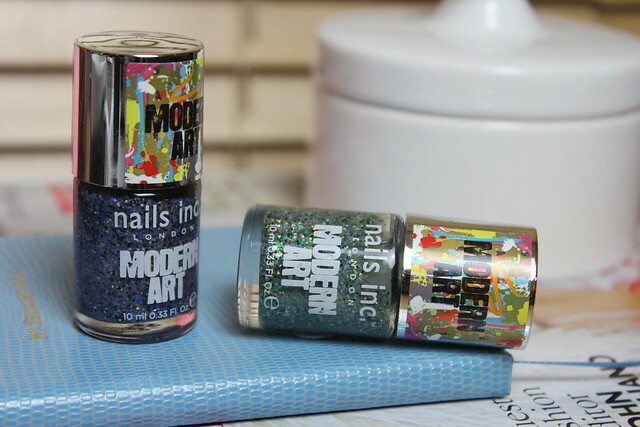 The modern art polishes are essentially mixed glitter, in a creamy base that dries to a semi-matte finish. When you look at it that way, they perhaps aren’t quite as new and creative as initially thought as the previous sprinkles polishes had a similar sort of effect – but the results are all in the quality and execution. What does the finish look like and how easy is it to apply (and remove)? The two shades I have here are Cromwell Road* (green) and Millbank* (blue) – on another aside, I am impressed that Nails Inc are still coming up with London names for polishes. I’ve shown them each on their own (two coats) and over a creamy shade of polish (FYI – the blue is the Blueberry Jelly Polish from Barry M and the mint green is Jaded from Sally Hansen). You could of course load up the coats on their own for total glitter coverage but personally I like them layered over a colour. You could also choose something neutral, or even a contrasting shade if you wanted to to create different looks. My favourite combination is the Millbank over the blue polish as a base and the chunky glitter still stands out, but compliments the blue base. Plus the golden chunks look good with the baby blue. Application wise, the main thing I noted is that the base liquid is really quite watery – which in some ways is good as it means you can move the glitter around to get an even distribution. But it also means that the base takes a while to dry and can be messier than some polishes. The combination of big and small glitter in both shades makes it easier to get an even spread of sparkle and they sort of cling to each other as you apply. Not always the easiest, but generally I find smaller glitter chunks are easier to get a decent application from – where big chunks or the sort of ‘sequin’ polishes can be a lot more effort. So ‘Modern Art’ the latest incarceration of creative glitter nails… what do you reckon, fad or fab?! I think it’s a great polish for glitter lovers… but perhaps the different names for every variant of nail might make it lean towards the trend category rather than a longer lasting style. I suspect we will be seeing lots of new creative launches from Nails Inc and other nail brands this year, I’m interested to see what comes next! In terms of other shades in the range – there’s an amazing looking one called Bankside (grey base, purple, blue and gold glitter) that I really want to try and a golden mix one called St Martin’s Place. I guess time will tell on how these shades sell and if other colours might be launched too. Oh, and before I forget – the removal is basically the same as any glitter polish, a bit of a pain but not the end of the world. Nothing the old tinfoil/acetone/cotton pad trick can’t fix! 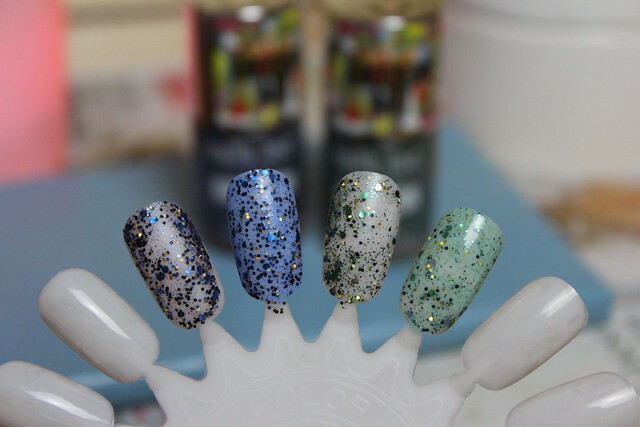 I’m always impressed by Nails Inc and I will probably end up adding these to my collection….I’m such a magpie for glitter polishes! I really like the look of the green one. Not sure if I’ll be getting any or not though. I definitely think I prefer them over the other polishes. As a glitter lover, these shades look right up my alley. Thanks for this post! These have a really interesting finish – I like the colours! The green one is so pretty! I need it in my collection.